Ever Feel “Runners High” When You’re Creating? I originally wrote a post about this topic in January 31, 2013, Ever Feel “Runners High” When You’re Creating? mainly because the subject fascinated me and I was convinced no matter what a persons method of creativity – sculpture, photographer, writer, artist of painters or drawing, etc. – the concept must resonate to some extent. I wrote about the many similarities of what runners experience and creative types, Ever Feel “Runners High” When You’re Creating?. There was a large discussion w/the post back in 2013 and after commenting with a fellow blogger and incredible artist, Janet Weight Reed yesterday along the same lines of thought it seemed like a great opportunity to open it up again. Do you ever feel a runner’s high when you create? 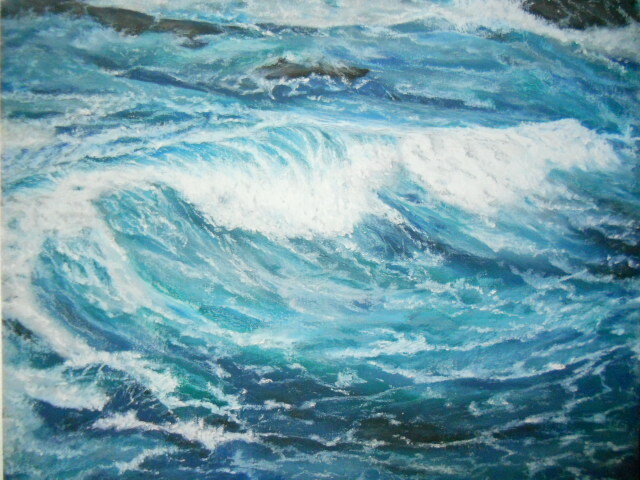 This entry was posted in OPs New Paintings, Posts and tagged art, fine art, ocean, Oil Pastel, painting, Sea, wave. Bookmark the permalink. 101 Responses to Ever Feel “Runners High” When You’re Creating? You are a fantastic artist that feels and connects to her subjects and pieces – there is no doubt in my mind that you totally get this Pizzuti!! Thank you Viladev for your lovely comment! OH yes. Nothing like that meditative state which can be elusive.Wonderful waves, Mary! Oh Elena, I so know that you connect in such an extraordinary way with your subjects – you describe it perfectly, “elusive.” Thanks so much!! Thanks so much Ralph for your generous comment about the wave – nothing like following a great wave into shore, the sheer power and awesomeness. And I totally relate. Because I’m a very enthusiastic person but it gets worse when I’m in a creative phase! Hey Cha – thank so much!! It doesn’t surprise me that you feel the rush when painting certain scenes or characters, you connect so well with your subjects. Here’s to artists endorphin rushes! LOVE! I can almost feel the breeze as the power of the wave washes in. Such beautiful depth and peacefulness. Each of your creations have it. This one I can look at and feel myself being lost in reverie. Totally understand a high feeling… but it doesn’t happen all the time. The Frilly Tulips that I have been working on have definitely been my ‘high’. It’s a wonderful feeling. Thanks for your beautiful feedback on the painting bbs! It doesn’t surprise me that you feel the high your work is of an incredible quality, but there is also a feel to it. It’s true as artists we don’t get the high every time, but when it does come with a piece we feel connected there is nothing quite like it. I totally feel Runner’s High during & after designing the costumes for a movie or TV show! Why doesn’t this surprise me Resa – that you would experience the endorphin rush. It seems to me that in order to design and create a costume, you have to develop a deep connection with the character to fully absorb and understand, and then to create the costume for the character as well as the actor. Very interesting, just love it! Hello Resa, I just had a good time spending a bit browsing your other blog and website – very simply a lot of fun and in awe of your incredible gown/costume work. Awesome! Such a shame that your work, which are all works of art, is marginalized by the art world – the art world at times is a bit too stuffy! What a wonderful comment this is to come home to! My Art Gowns mean a lot to me, and I would love their promotion of valued charities to become more meaningful. I started work at 6:00 this morning & at 8:15 at night , I am still working. I have to process my fitting pics from today, and mail them to the director, as well as I am dying 2 jackets… then it’s up at 5:00 to get back to work by 6:30. Your beautiful comment is food for my soul! Incredible work schedule Resa, reminds me of my grinding days ~ Happy Wednesday and best wishes for the rest of the week. Thank you so much for your lovely feedback – I really appreciate it! You are so dedicated in your daily paintings, which are wonderful – the discipline shows as you have a tremendous control over detail, of which I can’t get at that level in my smaller oil pastels. Have a wonderful weekend. 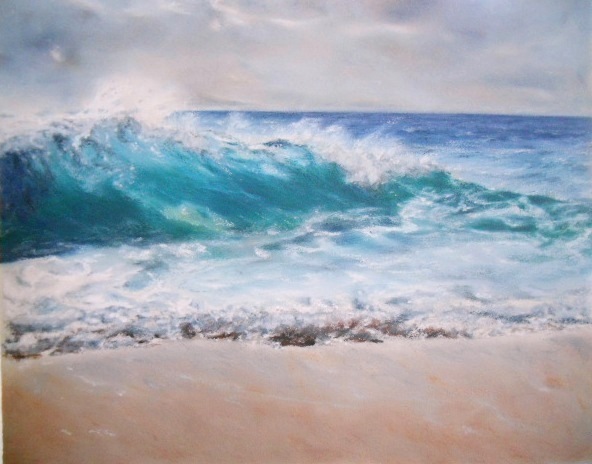 Thanks Jo – this was one of my earlier paintings and is one of those scenes that I think fascinate people when they are close and can feel the spray. I can definitely understand how you would be able to feel the energy and high when you’re totally absorbed in what you’re writing about. It’s the connection of one, while tuning everything else out ~ yes, I can see this happening for you. Have a wonderful weekend! Thanks, love 🙂 It’s a beauty! If you are interested in reading Janet Weight Reed’s fascinating discussion on this subject you can read her response here at the original post ~ Ever Feel Runner’s High When Creating? It is Eva, no doubt about it – I can tell from your writing that there is indeed a strong euphoric connection. Thank you for your beautiful comment and compliment! Awesome Wendy – it’s something that not everyone achieves, but when I guess when we get so totally focused on what we are doing and all click is when the endorphin rush explodes. Thanks also – it’s great to meet you!! Thanks so much Jackie! I totally understand and is great to hear that you achieve this whether through photography or an artistic endeavor – it happens. Makes the whole experience physically and mentally worth it, don’t you think?! Absolutely! Slip into “the zone”, whether it be through writing, music, painting, or actual running. It’s an intense feeling, and I’d feel sorry for any person who didn’t experience this sort of high. So right Pauline – it is exactly as you wrote, an intense feeling of exuberance. The high that is hard to explain, but when it hits (and doesn’t always happen) it is why we do what we do. Thank you Angie – I have to tell you I did not experience the runners high yesterday while out sweating the run!! LOL! When I write something that I like, I feel this way! This picture is gorgeous! I need to learn your technique! Very cool Michelle! It’s truly wonderful to read how so many writers experience this high while writing – could it be the pitch of concentration and absorption into the subject/character? Thank you so much for your feedback on the painting! Should one also ask the question, do runners get an artist’s high? 😉 I haven’t been in the zone like that for a long time. Occasionally it would happen when I was swimming for exercise. Great question Gallivanta, very cool in deed!! Oh yes, I think we could very much turn the table and ask, does the runner ever experience the artists high! I hope the zone comes back to you so that you can not only experience the feeling, but that of a certain freedom as well. thanks for giving me a creative outlet.. i am feeling much better, and the brain is finally starting to process again! i feel so much better, thanks! i’ve been cooking today for a friend who is sick, as are her two children… it feels great to be well! On the right day, I feel a runner’s high doing many things. I’ve always wanted to be a runner, though, so I could feel the real thing. I love your painting, it’s beautiful and beachy. Perfect! Very cool Elisa, we don’t have to be a runner to experience this – when everything lines up perfectly the runner’s high touches us. Thank you also for your feedback on the Open Wave!! If I’d done this painting, I’d be feeling that too! It’s a stunner! I’ve had a similar feeling with a few of my portraits. When I feel I’ve captured the person…it doesn’t happen every time, but when it does, I feel like I connected to my subject’s soul. It’s quite an incredible thing. Oh wow and this is what I’m talking about – there is a deep connection with the subject as you get to a certain point of working on the piece (in whatever form). Awesome that you have experienced the feeling. Thank you so much for your generous comment on the painting! Beautiful comment and I really do appreciate it! and yes, creating a work when all goes well, it’s like magic.. and yes, there’s a definite high attached…. You are so right Z – it is so awesome, right? It is nice when it happens whatever we are creating! Ah yes and when the euphoria hits there is nothing better. Very cool Coastal, you get it!! So right Maniparna, that high and extreme level of joy that comes with creativity – perfect description and I’ll bet you’ve experienced it various times with your writing. Thank you for your generous comments on the painting!! Oh yes, definitely get that high when I complete a scene that I’ve struggled with. I LOVE the painting, Mary. It looks so real…I wanted to sink my toes in that sand! Great job! Wonderful painting, Mary. Such depth in the wave, I can almost smell the salt air. I never really thought about it, but i do get a “high” when I am creating. Actually, felt it today. I hadn’t felt up to painting for a few weeks and today I did got a lot done on a painting that has been coming along slowly. Thank you Janell – so love it when one of my paintings has an affect on the viewer. That’s very cool that you experienced this today with finally feeling your paintings again – it’s when everything falls into place and clicks on a whole different level. So good Janell, have a great week. Hi Marina – thanks very much. Two things attracted me to paint this scene – the frothy sea-foam in the foreground and the translucent portion of the wave. It was an awesome and energetic scene to paint. Have a wonderful Thursday. Although I am a visual person I feel it more when I am writing than painting or photographing… when all the right words flow and I can’t type fast enough! Your painting is so expressive I can imagine you would feel that high painting it. Hello RMW, nice to meet you! Thank you for your thoughts – because it is just as you described – this joy, an experience difficult to put into words but it is there none-the-less. You get it – very cool! This is an outstanding painting! I can see why you feel the “runner’s high”. I can’t say I’ve experienced that with my painting. Although, I do have many moments where I feel at “home” in the process and tremendous joy. This is a different feeling for me than when I experience a running “high”. So beautifully done, Mary! I can feel the motion. I’m right with you Cynthia and knew you’d get it! “The zone” is what I’m talking about and often I’ll find three or four hours have passed while painting or drawing and I never realized that much time had passed. Also there is this feeling, I don’t get it with every painting, but when I do – it’s like all systems are on and I feel this rush because what I was painting I totally connected with and on a very different level. It’s a wonderful thing and aren’t we lucky to be able to experience this, I can’t imagine some professions ever reaching this level of exuberance in their line of work. Thanks Susan and I thought you would understand!! Yes, of course. That is the time when ideas swirling around in one’s mind get channelized into words and sentences in a torrent of sorts and one has forgotten even oneself, not to speak of one’s surroundings. That is a beautiful painting Mary! The light is exquisite, the splash of the water, absolutely gorgeous! I agree Mary! I’d like to be at that place all the time! 😀 Have a wonderful day! Oh yes and I totally understand! Very beautiful, one of my favorites from you. Thank you so much Lee for your compliment. Yep. I felt it this morning, but I pulled a calf muscle just ambling around the garden. And I know both from running.
! so funny Derrick – but not so with your pulled muscle. You must enjoy the experience of finding an awesome flower to photograph – the feeling of knowing that this is the one. Then I look forward to see your post later this evening Derrick!